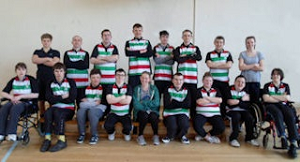 Stockport all stars special tag rugby Squad was established 9 years ago at Stockport RUFC to provide the opportunity for youngsters with additional needs to be part of a mainstream club where they can enjoy the company of their peers and participate in sport. We are the only Rugby Club in the North West running a Special Squad. Our aim is to encourage physical activity and social interaction, but above all to have fun. What is tag Rugby? There is no physical contact in tag rugby. The players wear 2 tags which are velcroed to a belt. The players ‘tag’ the opposition by taking one of these and the tagged player must then pass the ball to one of his/her team mates. No tackling is involved. Girls can play as well as boys and they can compete on an equal footing. Part of the tag rugby sessions will concentrate on building up individual and team skills in the form of simple relay games and drills and every session will include a game so these skills can be put into practice. Can my child access these sessions? The age range of the present squad is from 13yrs-36 but chronological age is often irrelevant as there is a wide variety of ability. Within the squad are several youngsters with Down’s syndrome, autism, Asperger’s, cerebral palsy, epilepsy, wheelchair users etc. If siblings without special needs want to be in the squad, they are also welcome. When? We train on Sundays 10.30-12.00 following school term times. Where? If the weather is fine we train outside at Stockport Rugby Club, Headlands Rd, Bramhall SK7 3AN. If the weather is wet or pitches are unsuitable, we play at Hazel Grove High School Rec Centre, Jacksons Lane, Hazel Grove SK7 5JX. Squad members are informed of the venue week by week by text and email. Do parents have to stay? No. Some parents do, to network etc. Hot drinks are available at both venues. Other parents take a supporting role, but parents are also encouraged to take this as respite time leaving the youngsters on their own to enjoy the training.